We are at a time of profound change in the retail industry, especially the role of the physical store. Manhattan seems to be in a strong position to enable and benefit from this transition. Here are some highlights from their recent user conference. Last year, revenue grew 10% to $415M, there were 300 solution go lives, $50M in R&D investment, and 26 product releases. Participating in the JDA and Manhattan conferences back-to-back highlighted the central battlegrounds for retail solutions. Omni-channel integration, and specifically distributed order management with profitable order promising, and managing fulfillment from the store, were key themes at both conferences. This has been driven by the relentless growth in online sales, along with brutal competition from Amazon and other pure-plays, as well as increasing consumer expectations for seamless cross-channel experiences. That seems to have reached some sort of tipping point or critical mass where most retailers understand their survival depends on getting it right. Both Manhattan and JDA also talked about their key initiatives targeting 3PLs as well. Eddie Capel gave a lively introductory keynote on day one of Manhattan’s Momentum 2014 conference. He seems to be flourishing in that role and Manhattan is doing well with him at the helm (see sidebar “Solid Growth”). The central theme of Eddie’s talk and much of the conference was on becoming “Commerce-Ready,” loosely defined as being capable of 24X7 sales, over multiple integrated channels, enabled by supply chain excellence on the back end. Eddie talked about ever-increasing channel complexity with so many selling, fulfillment, and delivery variations, driving the need for a sophisticated rules engine for order promising, backed by the right math and science to meet profitability and other goals. He referred to “Available-to-Commerce,” which includes a new ‘control panel,’ as part of Manhattan’s Enterprise Order Management solution, as well as the ability to do order promising (including changes to orders) that maximizes revenue, inventory performance, and fulfillment to customers. Manhattan did a redesign of the user interface for their existing, already mature, call center application. I saw a short demo and it was evident to me that a lot of thought and usability testing went into the redesign. All the key information is accessible and intuitively laid out. Manhattan said that 60%-70% of typical service calls can be handled all in the one main screen, providing a single, hierarchical view of all transactions across all channels. When a customer calls, the CSR (customer service representative) can see the order history, current order, and details of each selected item all on one screen. The CSR can even do product returns and exchanges all without leaving the original order screen. It includes a google-like search to allow operators to quickly find any customer, order, return, or item based on any field or description. It provides a rich set of omni-channel capabilities such as scheduling in-store pickup, ship-to-home, cross-selling and upselling. It supports split payments, in a well-designed visual interface that allows the CSR to easily process any mix of credit cards, gift cards, and e-check, automatically calculating the balance due after any gift cards have been used. A well-designed UI, that lets the CSR perform tasks rapidly and confidently, with a minimal number of clicks, is extremely valuable in streamlining and improving the customer’s call center/support experience. Manhattan aims to provide retailers with the ability to expand and contract capacity as demand surges and wanes throughout the year. By treating all inventory in the network as a giant pool, retailers can reduce the total amount of inventory needed. Orders can be directed to stores or DCs that have the inventory and can profitably meet the delivery needs of the customer. Manhattan said they can enable the retailer’s network to behave differently, depending on the time of year and customer demand, in order to fulfill on time and profitably. The majority of cost in a DC is labor. Many of the workers are younger. Manhattan introduced some tablet-based applications to address the challenge of getting productivity gains while creating a work environment that the next generation of DC workers can relate to. These applications allow supervisors to coach and manage workers, provide the ability to monitor and manage the performance of the team, with visibility into which jobs are lagging and which employees are doing well or struggling. Tapping on the listing for an employee on the screen brings up a page showing their picture, performance, and many other details about them. I attended a talk by Scott Fenwick, Manhattan’s Senior Director of Product Strategy for Store Inventory & Fulfillment. Scott said that Store Inventory and Fulfillment was Manhattan’s fastest growing solution and one they are investing heavily in. Typically they do one major release per year. For this solution, they have already had three major releases in the past year. Manhattan introduced their store inventory & fulfillment mobile application running on iOS tablets and phones (Android support is coming soon). It does inventory, receiving, and shipping all in one application, with the goal of zero training required. The inventory application lets the store associate view what is in stock, adjust inventory, and do cycle counting all right there on the phone. Enabling more frequent and accurate cycle counting is critical in today’s world. Store inventory accuracy becomes more important than ever when you want to do reliable order promising, incorporating fulfillment from the store. When the cycle counting can be easily stopped and started, interwoven with the other tasks being performed, it doesn’t have to wait until there is a long uninterrupted period of time to dedicate to the cycle counting task. To support this way of working, the application has a ‘PAUSE button,’ a very simple but very useful feature. It allows a store associate to ‘hit pause’ on their cycle counting or picking task, go take care of a customer or other urgent task, and then when done with the other task, ‘resume’ and the system brings them right back to where they left off. A great feature. The store associate can pick multiple orders at once. 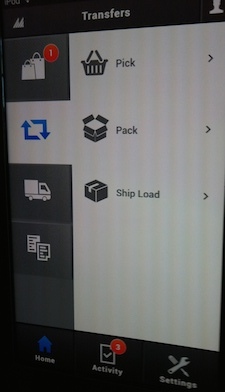 The application can show a picture of each item being picked and can require the associate to scan each item to ensure the right one is being picked (or packed). The system will not allow the associate to continue if the wrong item or wrong quantity is picked or packed. The application can also integrate with electronic scales. By knowing the weight of each item being picked, it can double-check that the right items and quantity are being placed into the box. This helps detect errors such as when the associate scanned the right items but did not put the right ones in the box. Once the associate is finished picking one or more orders, the system can be used to print the FedEx or UPS label and confirm pickup. If the order is being picked up at the store, it can require the customer to sign for it right there on the screen. There is also a receiving application which tells the store associate whether the item being received is destined for the store shelf or should be sent to the customer pickup area. The system supports store-to-store transfers as well. I’m a stickler for good user interface designs—not necessarily how attractive or modern looking they are (though that helps), but much more critically how functional and intuitive they are—do they make the job easy, fast, and obvious. 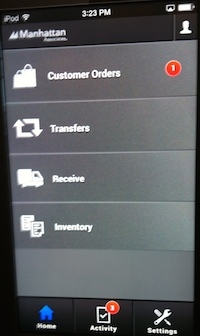 I was impressed by what I saw in Manhattan’s call center UI redesign and their mobile Store Inventory & Fulfillment app. I believe UX is a critical competitive battlefront for supply chain software vendors. The leading solutions have, over the years, built up vast libraries of very powerful algorithms, math, and capabilities. But a large portion of that power remains inaccessible to much of the business world, because it is too complex to use except by very experienced experts. When the system is too complex, the actual value achieved is often much less than the potential value of the system. Good UI design unlocks a lot more of the capability and value, while dramatically reducing time-to-value by reducing or eliminating training needs. We see the major SCM players putting significant investments into ease-of-use and good UX. Manhattan is aiming for ‘zero training required’ solutions in the store. I received a demo of the Store Inventory and Fulfillment apps from Vijay Ramachandran, Manhattan’s director of marketing programs. He told me that the design philosophy for these was, “Don’t make ‘em think. If the store associate has to think about what to do next, then we lost the battle.” He added that nobody downloads a training manual when they download a regular consumer app for their phone … why should they need training for our apps. As a former software engineer with UI design experience, I was impressed by the simplicity of their UI design for the Store Inventory & Fulfillment App. In fact, as an amusing way to illustrate just how simple and easy to use their UI is, they asked some five to eight year olds to execute specific store tasks. You can see the videos on YouTube here: Ship-From-Store, Made Simple; Store Inventory, Made Simple; and In-Store Pickup, Made Simple. This type of simplicity is paramount, given the high level of turnover and difficulty of doing extensive training in the retail environment. SCI includes multiple different report authoring tools, depending on the level of complexity and sophistication needed. It includes ad hoc analytics connecting multiple databases or data cubes for slicing and dicing. There’s also an event studio, which can generate an alert based on any data element and condition you want to put on it. 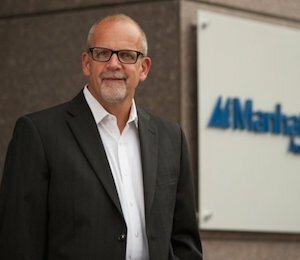 Manhattan told me that the SCI application, combined with their experience, greatly shortcuts how long it takes to get BI up and running in the way the customer wants. Most commonly, customers use it for operational reports, typically generated on a regular schedule for executives and operational managers. 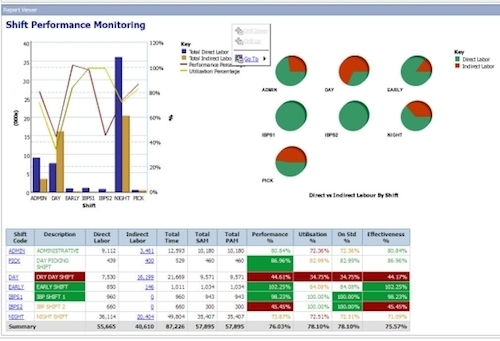 It comes with a set of standard reports that can be customized. You can do trend analysis, such as what is selling well, performance of workers on various shifts, what are the dead SKUs, aging reports on categories, plan vs. actual feedback for merchandisers, and so forth. It can be used to figure out why someone or some part of the business is underperforming. The word ‘transformation’ is thrown around all the time to describe just about any IT initiative. However, it does seem that we are at a time of true transformation in retail—a real inflection point, with profound changes happening in how customers are being served and in the fundamental function of the physical store. Manhattan seems to be doing a very good job at leveraging their core strength in the warehouse and supply chain to build a set of capabilities to help transform retailers. Manhattan is certainly not the only solution provider trying to do this—the competition is fierce. But I was impressed by what I saw, particularly in the UI/UX domain, which can make all the difference. Manhattan is a formidable competitor in this battle to be the supply chain and omni-channel fulfillment solution of choice for the new retail reality.